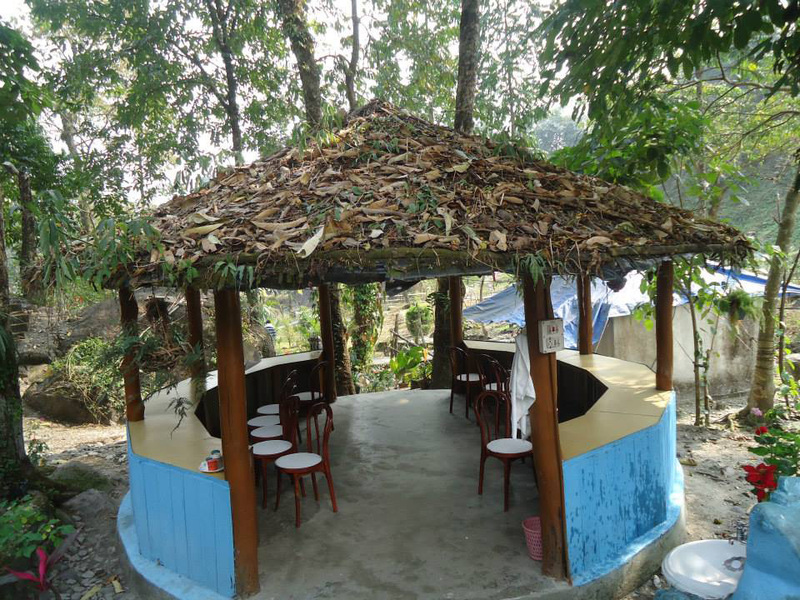 Jhallong is around 103 kilometers from Siliguri which is considered to be the gateway of North Bengal. 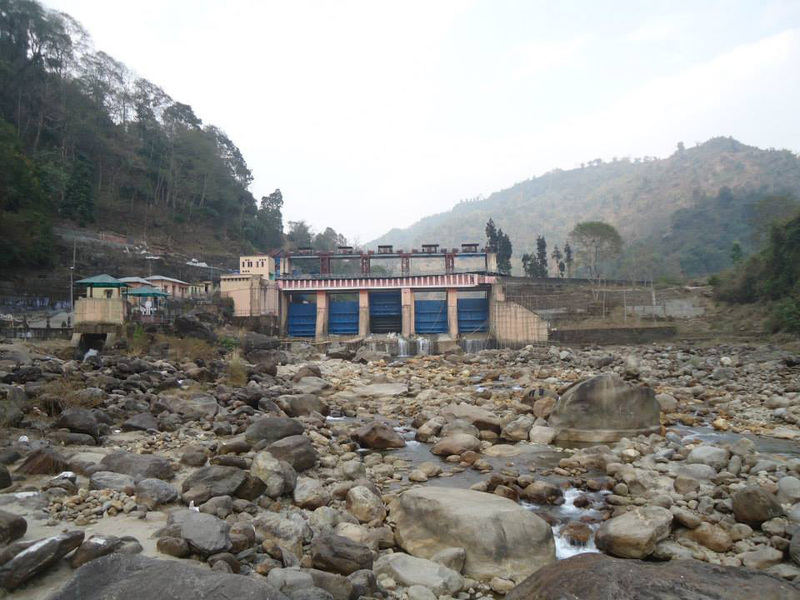 It takes more or less 3 hours to arrive at Jhallong from SIliguri in bus or by a car. From Chalsa Jhallong is 55 kilometers and if you are travelling by train, you have to reach at New Mal junction. The nearest airport is Bagdogra. 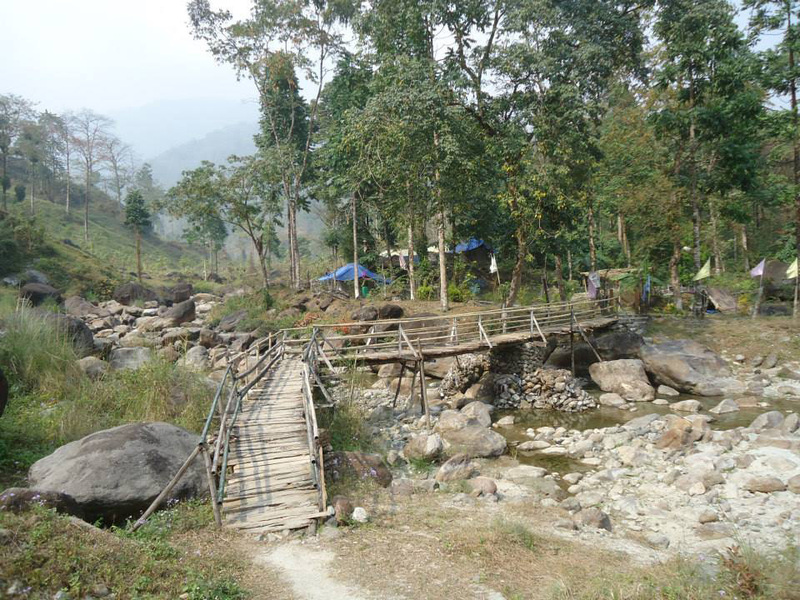 The route leading to Bindu-Jhallong is beautiful with forests, villages, hills and elephant corridors. This zone is famous for animal viewing where you can find leopards, bison, deer and of course elephants. The first glimpse of Jhallong from a hilltop is absolutely out of the world. 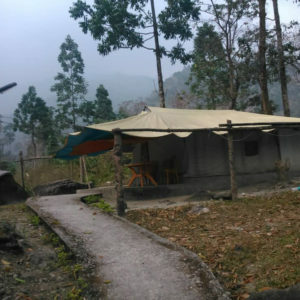 The best option for accommodation is the Jhallong river camp along the banks of Jaldhaka River. 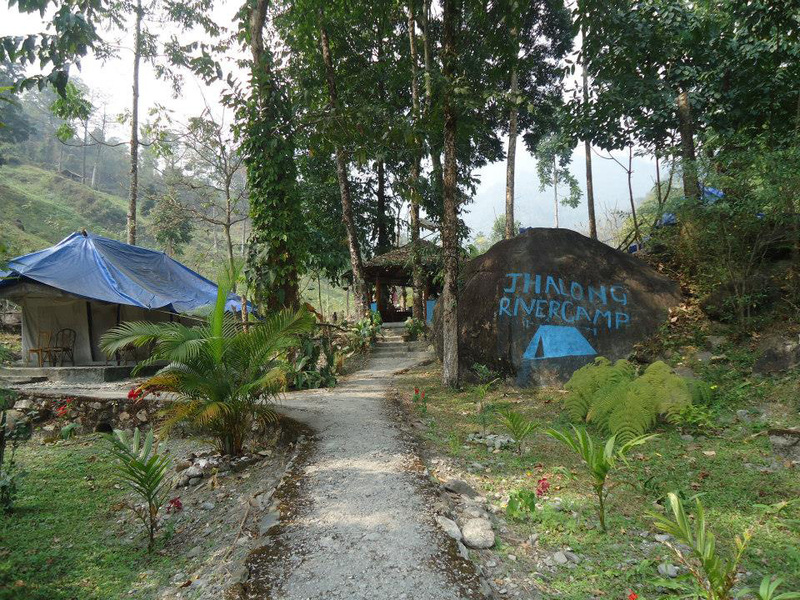 You have to leave your camp at the check post before entering the charming river camp. 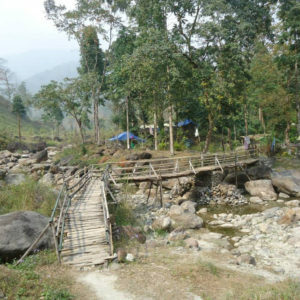 A small wooden footbridge over the meandering Jaldhaka and massive boulders will take you to the camps developed by WBFDC. There are 10 tents in the area and all are well facilitated and insulated to provide protection from the cold outside. The bed inside the tent is huge and the bathroom is attached to the room. They also have a small dressing unit for the visitors and a camp cot outside tents. 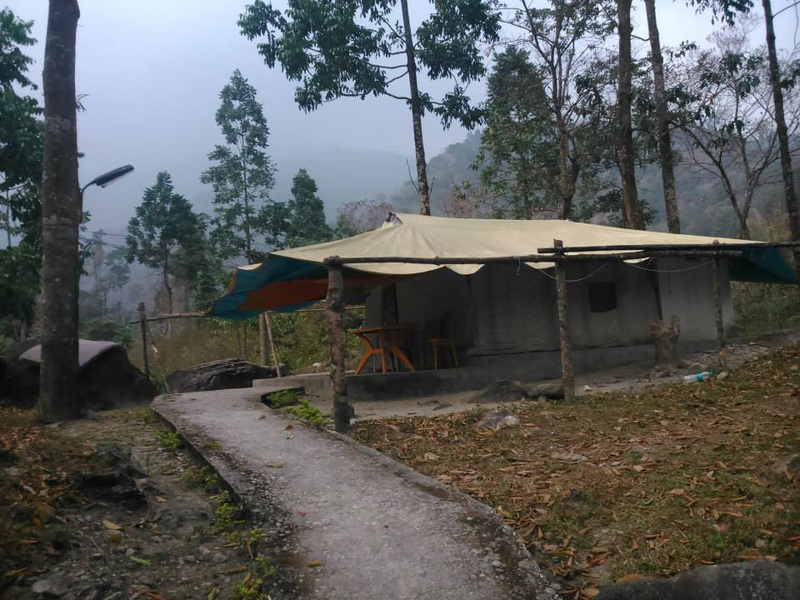 The cost for the river camps is 1200-1500 INR depending on the bedrooms. Apart from the pollution free mesmerizing weather, there is another advantage of living in the camp; the performance of the local people. In the evening you can witness a lovely song and dance performance by the local people while feasting on hot momos and barbecued chicken. For dinner the Hakka noodles and Chilli chicken is highly recommended. In the morning and also during the evening you will be served with high quality fragrant tea to calm your taste buds. They can arrange Barbeque and Camp Fire with extra cost. 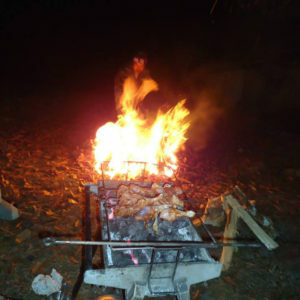 Camp Fire costs around 500/- and Barbeque depends on the amount of Chicken you’d take. 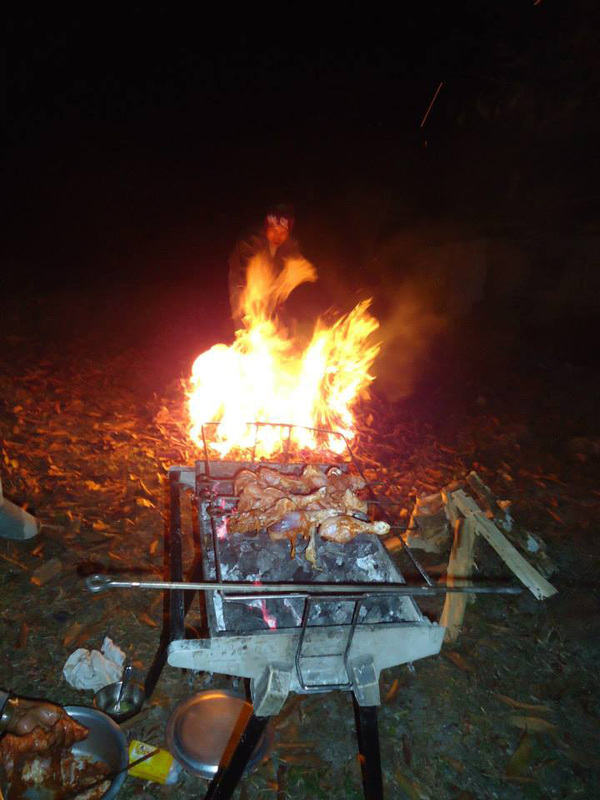 Chicken cost cost may vary 400/ – to 500/- per KG. Wake up to the gushing sound of the Jaldhaka in the morning and admiring the sunrise over the mountains while sipping a cup of hot tea. 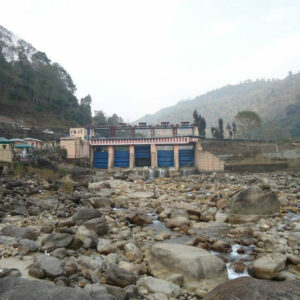 Once you have finished the breakfast start the day with a village tour followed by a visit to the hydel power station. If you love the river most, then you can angel in it for sometime or go bird watching. Brown Dipper, Little Fortail, Crested Kingfisher, Slaty-backed Forktail, Eurasian Wryneck, Laughing Thrush are some the species you will notice. Since the entire region is full of trekking trails you can take one to reach Todey and Tagta points to admire the panoramic view. 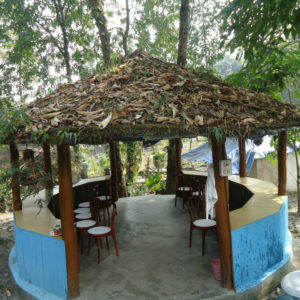 This entry was posted by indispottravel in Bird Sanctuary in West Bengal, Dooars in West Bengal, Forest Bungalow in West Bengal, Jungle Safari in West Bengal, Picnic Spots in West Bengal, Weekend Destination around Kolkata, West Bengal and tagged accommodation at Jhalong River Camp, attraction of Jhalong River Camp, attractions at Jhalong River Camp, bird watching at Jhalong River Camp, cost of Jhalong River Camp, cost of living at Jhalong River Camp, distance of Jhallong from Chalsa, distance of Jhalong River Camp from NJP, distance of Jhalong River Camp from Siliguri, dooars, dooars in west bengal, doors north bengal, dours tour, eco tourism, fooding and lodging at Jhalong River Camp, Forest, hot to go to Jhalong River Camp, hotels at Jhalong River Camp, how many animals are available at Jhalong River Camp, how many animals can be seen at Jhalong, how many tents are available in the Jhallong river camp, how much time takes to reach Jhalong River Camp from Siliguri, how to reach Jhalong River Camp, Jaldhaka hydel power project, Jhalong, Jhalong resort, Jhalong resort by West Bengal Forest Development Corporation, Jhalong River Camp, Jhalong River Camp location, jungle, living cost at Jhalong River Camp, night stay at Jhalong River Camp, night stay cost at Jhalong River Camp, night stay cost of Jhalong River Camp, north Bengal, reaching Jhalong River Camp, resorts at Jhalong River Camp, room availability at Jhalong River Camp, room rent at Jhalong River Camp, room tariff at Jhalong River Camp, staying options at Jhalong River Camp, tent room condition in the Jhallong river camp, tents accommodation in Jhalong River Camp, trek to Tagta point from Jhalong River Camp, trek to Todey point from Jhalong River Camp, which is the best option for accommodation in Jhalong River Camp, which is the nearest rail station of Jhalong River Camp. please give your phone number.